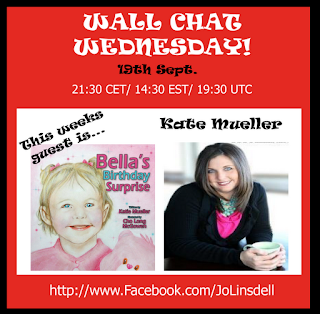 Today I'm hosting a wall chat on my Facebook page as part of my new feature called "Wall Chat Wednesday". Each week I'll be joined by a special guest for a half hour chat. This weeks guest is children's authors Kate Mueller. Kate will be joining me to discuss her children's book Bella's Birthday Surprise and to chat about book marketing, creating applications, being a writer mum and more. "From poems to short stories, I have always enjoyed putting my thoughts down on paper. After graduating from Purdue University, my husband and I settled down near our Indiana childhood homes. We now have two beautiful daughters, Bella and Sofia. We have cherished countless hours curled up reading together. It was from this experience that I knew I wanted to leave something for my daughters and future generations. A book was the perfect choice". If you have your own questions for Kate please feel free to post them directly to the wall.